Ribeira has a large sandy beach at the opposite end of town to the port and this extensive stretch of sand has lifeguard posts, showers and beach side bars. The area is clean and attractive and offers a good view of the town as you look back and around the bay to the right. There is also plenty of free parking close to the sands. 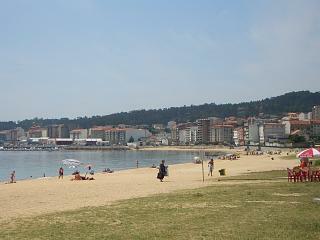 Left, a view looking across from the edge of the beach and back to Ribeira. The port is out of shot to the left and the sands extend a considerable distance behind the position from which this photo was taken. As you approach the sea, the reason for the lifeguards becomes evident as the beach drops away quite steeply in to the ocean. The waves however, are only moderate and the beaches popularity is demonstrated by a large number of ever present bathers. On the downside, the sand is quite coarse, so you need to be careful at the water's edge. Additionally, it is one of those beaches where on a hot day the sand feels like it is on fire, so make sure that you have sandals or beach shoes. The water by the way is cold! Other things to look out for at Ribeira's main beach - Whilst this is not a beach that we go to frequently, we have seen dolphins there on each and every visit. They seem to be in groups of between three and six or seven and can often be seen in playful mode. Someone told us that they like this part of the ria because of the fishing boats that often throw fish waste back into the sea as they approach the port. For anyone who likes Yachts, the bay area in front of Ribeira's beach seems to attract a number of large and expensive yachts that moor in the bay for an afternoon or a day. The best beaches in the Ribeira area are (in our opinion) found as you drive along the coast and through the districts and villages that are dotted and located on either side of the main town. 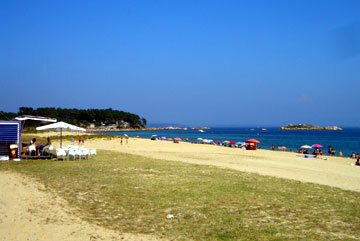 This part of the shore is quite literally peppered with small villages, each having a well serviced and accessed beach. We took a closer look at a couple of, what at first appeared to be, tiny beaches, but that when we parked up had lifeguards, volleyball nets and even beach side tennis courts. 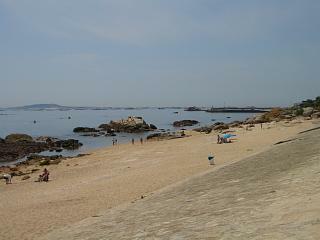 The beach in the photo to the right was a prime example of one of these and even had its own mini fishing port. Nearly all of these beaches have the provision for parking, most have a bar or ice cream cabin (with chairs and tables nearby) and many have attractive paths or verandas running the length of the beach. Quite a few of these beaches also have a jetty or key (sometimes featuring a ramp) where a few small fishing boats can dock and moor up. Below, yet another of Ribeira's tanning spots. This one had a long patio area at road level (elevated above the sands) with a bar and plenty of benches. 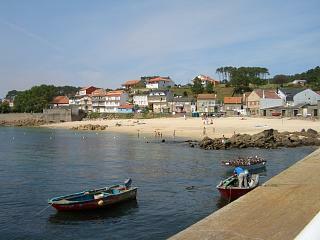 If you like beaches and sun bathing and especially if you like to beach hop in a small locality, Ribeira is ideal. Some of the beaches we saw really were nothing short of picturesque and most were semi deserted – even the ones with lifeguards. The coast at Ribeira also affords fantastic views out to sea which, in this area, are punctuated by many projecting rock formations. All told the villages around this town contribute to a mini sunbathing meca. If you want to see more of Galicia's beaches, take a look at our menu area describing the beaches and bays of this rugged part of northern Spain. Equally, to visit more towns in the region take a look at our section covering the towns and villages scattered throughout Galicia.